Circling twice around McQuixote Books & Coffee before spotting it, I was convinced, Stefon from Saturday Night Live would show up to review my book talk and signing. 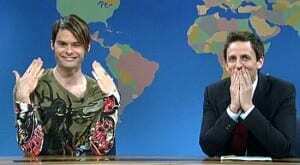 I did not expect Stefon to be a no-show. The Portland Arts District of Louisville, Kentucky is precisely the kind of environment to turn Stefon giddy – an old manufacturing and warehouse district; surrounded by decrepit homes in need of preservation, reconstruction, or demolition; surprises around every corner; and not a sign in sight to tell you where to go or what to do. Here’s where “it” happens. Bring imagination. Something will come of it. I thrived in this kind of place when I was a boy. A district just like this lay between my home in the projects and the stench of the Chicago Stockyards. Among derelict castles of industrial commerce long gone, Kenny Grail and I imagined ourselves as medieval warriors, battling demons of destruction. Our creative innocence slayed dragons that darkened every corner. We became heroes of our imagination. 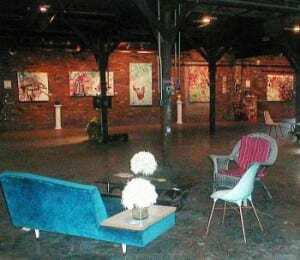 Today, Chicago is revitalizing our abandoned playground with art galleries, trendy coffee houses, and performance spaces, as is Portland’s district. 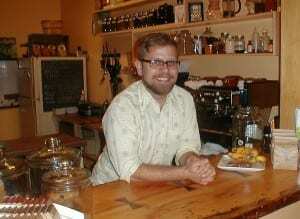 My host at McQuixote was Trevor DeCuir, one of its three owners. In no time at all, we were talking Ecuadorian coffee beans, business, books, and art. Mmmmm. Was it the coffee that was making me feel rather youthful? Once around age 11 or 12, I left Chicago with the only possession I thought worth taking – my typewriter. I was headed for Greenwich Village in New York to become a Beat writer like Jack Kerouac. 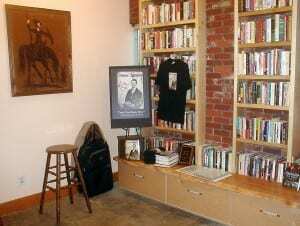 I was going to read my poems in basement coffee houses and live off the brew. I never got the chance, though. A young kid from Minnesota kept showing up with his guitar. He sang his poems. They never let Bobby Zimmerman off the stage. I never got on. Finally now, at McQuixote Books & Coffee, my time was here and now. Like back then, my set up was simple. I was ready to talk about my writing and listen to the finger snaps of appreciation. And where are you now, Bobby? You’re secluded in your house in Malibu, releasing old tapes from your basement. I’m here in Portland, sipping coffee, waiting for Stefon, about to talk about my book in front of a live audience. Take that, Bob Dylan! Having arrived an hour early, Trevor invited me to have a look around. 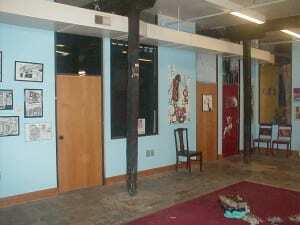 Beyond the book & coffee shop, I discovered a warren of artist studios. I peaked in some windows. A lot going on. A child whizzed past me on a scooter. I followed the child and heard the voice of an artist, at work, talking to their creation. The child whizzed past me again, leading me down a small gallery into a large gallery space. Art was hanging everywhere. I stopped at each one, taking it all in. 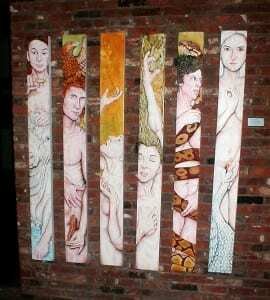 The quality of the art was good, if not exceptional. Everything was affordable. 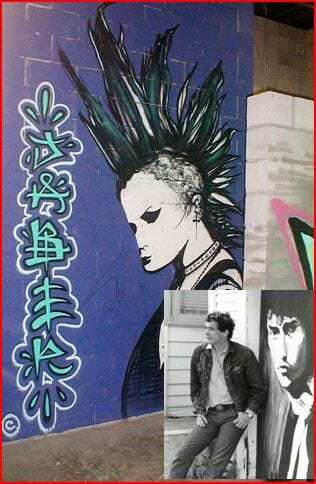 A wall mural caught my eye, reminding me of my acting days, when a photographer posed me beside a wall mural in California at Venice Beach. Graffiti art has come a long way since. The murals here, you can step inside of them, it seemed. In the theater space, I met Tim Faulkner. I told him his place reminded me of when I used to work at Andy Warhol’s weekend nightclub, the Exploding Plastic Inevitable. 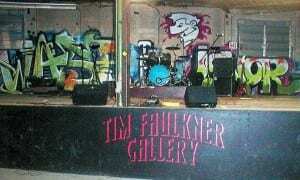 Tim’s space is a catch-all for all types of events, too, from performances to weddings. A film crew was outside, working on a documentary, like Andy used to do with his camera while Lou Reed, Nico, and Velvet Underground droned under my strobe light. The adorable child on the scooter whizzed by again. Back in the coffee shop, my audience assembled. We didn’t wait for Stefon to arrive. This was not going to be a sterile book lecture. Like a couple of book talks I’ve had in private homes, we all sat around casually. I began talking, but soon all of us dissolved into conversation, following the flow of everyone’s interest with my material. At times, I found myself more interested in the theatrical work Jack Francis from my audience was doing with the young people of Louisville. 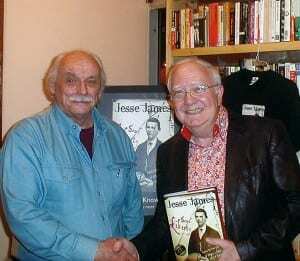 He was taken enough by the show business types from the Jesse James family, enough to take home a book. Stefon was a no-show, but I was thrilled when Trevor posted on McQuixote’s Facebook page, “Eric F. James was a treat to have at the shop and we’ll be hosting him again soon, to be sure!” I can’t wait to return. I left some authorgraphed books behind for anyone who missed our event. 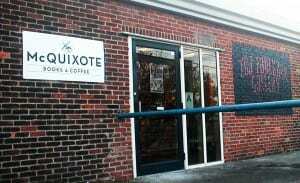 I may be as old as Don Quixote, but I found no one at Portland’s McQuixote Books & Coffee tilting at windmills. For anyone with a future in their eyes, this is a place to do and be. Do you read me, Stefon?